Truth. Writing is hard. Greater truth. Primary research is harder, especially when the subject led an elusive, often-desperate, carousing sort of life. 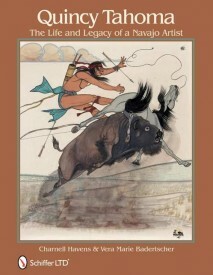 That’s one reason (among many) Quincy Tahoma: The Life and Legacy of a Navajo Artist is such a triumph. The details dug from scraps. The real-life characters interviewed. The piecing together of biographical bits astound me nearly as much as Tahoma’s life story and artwork. Authors Charnell Havens and Vera Marie Badertscher, a couple of sorority sisters going way back, weave the various narrative threads with skill I doubt I could manage on my best day. What first seems like an “art history” book, Quincy Tahoma casts a broader biographical net — catching painful, telling insights into flawed social, legal, and educational systems in the process. It’s no wonder Tahoma drank himself to death at such a young age. Many of Tahoma’s paintings feature striding, epic, glorious horses, so our equine-loving friends will enjoy that aspect. Some also include dogs, reflecting the Navajo sheep herding tradition and the ever-present coyotes and wolves. Clearly, however, Tahoma didn’t pay much attention to dogs in life because the ones in his paintings shine with only a fraction of the passion seen in his horses. I say that both as a dog-lover and as a girl who minored in Theory and Practice of Art (art history + studio classes) in college. There are many things I like about Tahoma’s paintings, but the way he generalized dogs isn’t among them. One untitled painting (circa 1951) depicts a young girl teaching what looks like a red border collie to sit up and beg. A few sheep graze in the background. Girl. Dog. Sheep. What’s not to like? Alas, the copyright issues around posting images of the paintings prevent me from being able to show you that one dog-centric example of Tahoma’s work. 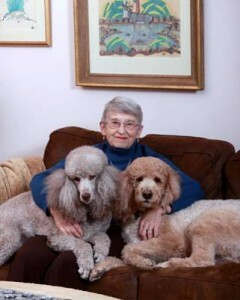 Instead, please enjoy this photo of Havens and her dogs (Paisley and Yogi Bear). One of the funniest little tidbits the authors dug up on Tahoma is that he gave people pictures of himself, which was unusual at the time. But, the more I think about it, it isn’t that different from those of us who use photos as our online “avatars” these days. Perhaps, he was simply WAY ahead of his time when it came to name / face recognition in his social connections. Here, Lilly and I thought we would be the first canine-centered team to review the Tahoma book, but another pooch beat us to it. Check out this Ecco D’Oro book review. You can learn more via the Quincy Tahoma Blog (and buy a copy of the book while you’re there), on the blog / book Facebook page, via the Quincy Tahoma authors on Twitter. I also found these interviews and additional content fascinating. Such a thoughtful review, Roxanne. Taking the time to really study the art reveals such fascinating things about the time and person, little nuances that make the reading feel more intimate. Tahoma did seem like a big-time charmer, according to what I’ve read from the book’s authors. No wonder he gave his photo out to everyone he met! What a fun review. I need to buy a copy of this book!! fine review, Roxanne. thank you for including a link to my story as well. glad you enjoyed learning about Navajo (and other) road trip music. Love the review, Roxanne. Thanks! Funny– love the dog book review! I think it needs a doggie rating system though. Five barks? Roxanne, love how you tied in animals (including the dog photo of Havens)! I also enjoyed reading your review. Sounds like the authors did a marvelous job of weaving together the art, research, and narrative. This was a great review. And, animal-lovers, don’t forget the herd of buffalos on the rampage on the inside cover. Some of the images are so poignant, like the one showing tourists taking photos of Native Americans. Thanks for this review – I esp. like your point about “olde time social media” – that was interesting! As a friend of one of the co-authors, Vera, I know how hard she worked and how long it took. I’m sure she’ll be thrilled by your review (just about to post it on our Tucson Women Writers listserve). The other one is a hoot too. Bravo! The best review yet (well…. almost)! I had no idea you had such a thorough art background. Have I missed it, or any chance you’ll be including more posts about maybe what you learned in art courses and whether they’ve translated at all into your work with your pooch? What a lovely review, and I love the photo of Paisley and Yogi Bear, sitting so nicely with Charnell. What a beautifully written, insightful review of the Quincy Tahoma book. Thank you, thank you, thank you! You are welcome, Charnell. I loved being able to include Paisley and Yogi Bear. It’s a great pix.